Tess Stapleton of Fairfield Ludlowe dominated the action last year as a freshman, and this year she is crushing the hurdles competition again with a 8.25 mark that won Class LL. In line behind her are M winner Ayesha Nelson (Hillhouse) 8.48, L champ Shelby Dejana (Wilton) 8.61, and M runner-up Kayla Clark (St. Joseph) 8.64. Class S winner and Bloomfield junior Terry Miller is US #2 at 7.03 and can flat out fly. Miller is sprinting a large distance ahead of L winner Cori Richardson (Windsor) 7.23, LL champ Kate Shaffer (Conard) 7.24, S runner-up Chelsea Mitchell (Canton) 7.31, and M winner Ayesha Nelson (Hillhouse) 7.33. This is likely the girls event with the best shot at producing a meet record. Could we have another photo finish between Bloomfield teammates Terry Miller and Jillian Mars who battled to a 1-2 finish in Class S just .02 seconds apart? 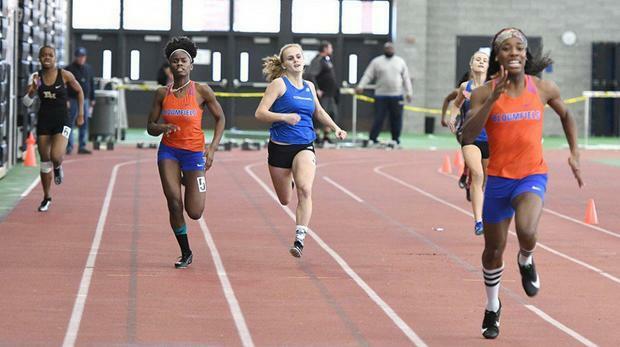 Miller ranks US #7 for the 38.90 she ran at the Yale Classic, and 2018 States runner-up Mars went to US #34 for her 39.93 while taking 2nd in S. Also most closely in the running if Miller and Mars lose any edge from their exploits in the 55m (Miller) and 600m (Mars) will be Glastonbury sophomore and LL winner Samantha Forrest at 41.42 (40.54 at Yale) and Hillhouse's M champ Jada Boyd at 41.44, both seed marks coming in their Class wins. Hillhouse senior Jada Boyd will be seeking a big rebound from last year's 12th place finish as she leads the 600m contestants in the seed times with her Class M championship time of 1:36.98. Simsbury's Elsa Martin is right behind with her huge win in L at 1:37.66, and three other runners under the 1:39 mark include LL winner Kamillah Diaz (East Hartford) 1:38.73, M runner-up Julia Rosenberg (Weston) 1:38.80, and LL runner-up Emily Alexandru (Trumbull) 1:38.99. Also coming in with the sixth best seed time and actually the best time overall from her 1:36.79 while winning at Yale is Bloomfield's 600m S champ Jillian Mars who won her Class race by more than 5 seconds and could conceivably find another gear in the CIAC. Glastonbury freshman Molly Harding comes in with the 7th best seed time of 1:39.57 but showed extra potential with her 3rd place finish in the 300m at Yale and 600m best of 1:37.49 at New Balance.